Almost done with the second row of stars. Piplup and Turtwig didn't like the loud thunderstorm we were having, so they (along with the little one, Panda and Riolu) got up to help me take this picture. Knitting looks better with friends, doesn't it? Or, I should probably say "Great Aunt Iris" (You may be wondering "what is she talking about now???"). My mother was taught sewing and needlework by her Aunt Iris in the 1940's. Iris was a school teacher, botanist, grammarian, gosh knows what else, but also a truly excellent seamstress. And she drilled into my mom that if the back of your work doesn't look just as neat and nice as the front, you're doing it incorrectly. (I'd have said "wrong", but I suspect Iris would say "incorrectly" so there you go, homage to Iris.) So . . . Here's the stars intarsia, front view. Not bad, I like it. I totally broke form this time and measured the pieces of yarn. Yup, measured how long a stitch was, and I've measured out all the bits to piece together each star (I use 2 pieces for each star and for each lining as I split each star in half to minimize carrying the yarn in the back). I never got to meet my great Aunt Iris, but I think she'd think this passed the test. But I bet she'd think my color choices are gaudy beyond all belief. I started work on the stars jacket. Not very much work, clearly. But I did do a some swatching, very messy and scattered (swatching intarsia is heavy going, I find so I usually do just enough to be sure my gauge won't be too far off) but that's been ripped out and I'm jumping in. Background will be handpainted, the star outlines purples, the star bodies teal and black. I'll take a picture once I have enough done to show how it looks. I'm still in this stop and go place with spinning. What is it with these weird stall outs I keep having? Here's a larger picture to give you a sense of the whole piece, and a closeup for the detail. Overall, I think it worked out okay. The beads and yarn are close enough so the effect is pretty calm and doesn't detract from the lace pattern, but there's enough iridescent sparkle to the beads so that they have a little eyecatching-ness to them. 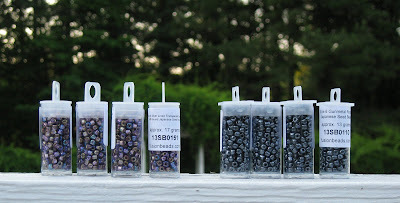 Even with so few beads - I really tried to restrain myself - you can feel how they add to the weight of the overall piece. 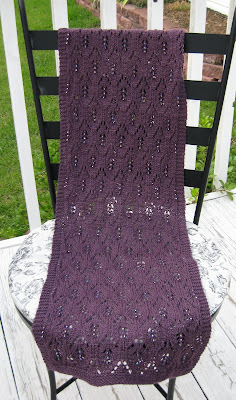 It took 2 skeins of gloss and 2.5 vials of size 6 beads to complete this scarf. It isn't a long scarf, more like a wrap around your neck one time and tuck the ends into the front of your coat. I think it blocked really nicely - I did my usual routine of gently rinsing the peice in warm water with baby shampoo, then rinsing again with conditioner (I think the silk in this yarn really liked that last step), roll in a towel and gently press, then lay flat. I don't have a blocking frame or wires to put it on, but it came out okay. Dried in under 12 hours, as well. Anyone have any great ideas or tips about blocking? I'd love to hear 'em . . . .
Not actually shielding her identity . . .
With the small purple ball of yarn. Yup. Still not happy with my idea for the hand painted. Need to swatch it (is swatch actually a verb?) but I'm thinking hand painted background, purple outlines, dark teal stars. Sounds workable to me, but I need to see it to see if the balance works as I imagine. 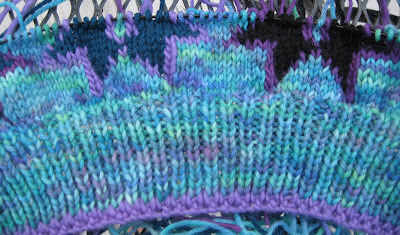 The thing about this Fassett pattern is that this one is intarsia, which makes it very labor intensive - I guess in the best-of-all-possible-worlds, one would measure from the pulled out swatch what each pattern component requires, then pre-cut all the yarn pieces to the right length. I'm just not that, um, careful (be polite). Nope, I do intarsia with each part of the pattern attached to a nearly full sized ball, and just shove the shaggy thing in a pillowcase when I'm not actually working on. Maybe I'll have a sample in a day or 2 to share. Not much time to make a real swatch, but I think this works much better than the black. I'm still happy with the gauge, but I'm not sure how I'm going to distribute these 2 colors. I'll have to think about that. The blue shawl is crawling along glacially, and the Matrix is 2/3 way through the second ball. I may not need that third ball - I like scarves to be hugely long, but maybe not so much with this one. The beads might make it too heavy, and I'm not sure a beaded scarf would be great for wrapping around your head - more like an accessory, really. And here we have the tiny amount of progress on the shawl I've started. Oh, and look, I've taken another really bad picture. The family gift; I've got it. Anyhow, it gives you a sense of the color and pattern - wait till I have about 6 inches - getting a snap of anything shorter than that on circular needles is a bear. Shimmer is really nice - it has a glassy quality that makes the colors really luminous and it's just a little fuzzy so it's not quite stark when you make lace with it. But man, this thing is going to take over a year to complete - so many tiny little stitches! Yet I know I'd take on a sweater with just as many stitches and rows without blinking -- which is odd. I'm hoping it's one of those great things that creates an enormous sense of accomplishment, rather than months of hair-tearing. Had another thought about Amy Rose last night - what about doing Amy with 2 strands of Shimmer instead of Bare (say Blue Glass and Turquoise Splendor, or maybe Lilac Dream and Cumulus) and dye the lace weight mohair something soft and in between. The Shimmer wouldn't have the body of the Bare, but the overall fabric might have a really nice drape. Except that I'm sort of stalled out. Oh, and the small person ended up being called in to a regional tournament this weekend - that sucked up both days and last night (till 10pm - but worth it, we're really proud of him). And it's been in the 90's. 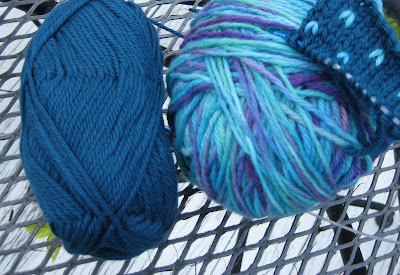 And I'm out of materials for all my projects I want to work on right now (I need blue for the side to side sweater and more beads for the Matrix) and for whatever reason don't have the spinning bug lately. 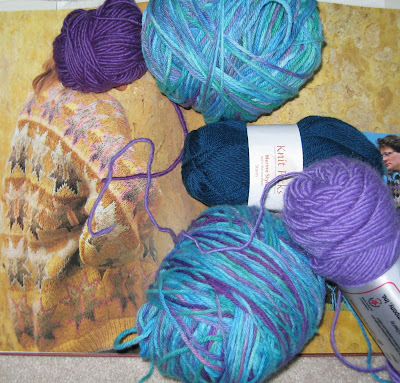 I've started a shawl in knitpicks Shimmer Blue Glass - but I have less than an inch done, there's no picture to take there. While I still like the idea of spinning some BFL, I'm wondering if I don't want to do the fishing shirt idea in Merino Style, maybe cinnamon or moss. I have to say I was very impressed with Merino Style, much softer than I had thought, and seems to have really nice stitch definition. From Lori, whose blog I like a lot. 1. Do you knit or crochet? Knit. 2. How long have you been knitting and/or crocheting? 33 years. Ouch. Okay, I learned really young. Like, 4. 3. What’s your favorite yarn to work with? Wool with some cotton or silk in it. 4. What’s your favorite needles/hooks? Inox. 5. Do you spin? If so, spindle or spinning wheel? Yes, spinning wheel. 6. What’s your favorite fiber to spin? Merino, but my experience has been limited. 7. What’s your favorite project to make? Sweaters. 8. What’s the hardest project you’ve ever made? Kaffe Fassett's stars cardigan. 9. What’s the project you’ve had the most fun making? Same. 10. What’s the ugliest project you’ve ever made? 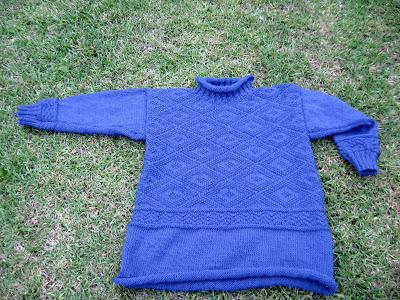 The big blue sweater I made for my dad that looked like it was designed for an orangutan. I was 15 and I made it in under 48 hours. There have been some horrible color combonations, too. 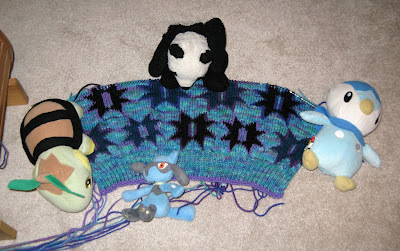 Lori answered "My first sweater" to that last question, but I was hoping for a picture. I haven't made anything too heinous lately. Lori - what's your favorite brand of yarn/yarns??? Well, that's just what it's making me think of right now. This is size 6 seed beads knit into knitpicks gloss cosmos, using a shawl pattern from Cheryl Ober's Folk Shawls (Kimono shawl cut down to scarf proportions). I've never knit beads into anything before, so how many to put in and where they should go are kind of tough to figure out. The second picture shows this a bit better, since I've set up the beads into decending straight lines, the overall effect reminds me of Joe Pantoliano and Keanu Reeves watching the green code trickling down like rain in The Matrix. Again, I think it will be better when it's blocked. TMC has quoted me about needing 3 different projects going on varying levels - I need to get on the stick and get a dummy going, as right now I don't have anything I can not look at as I work. 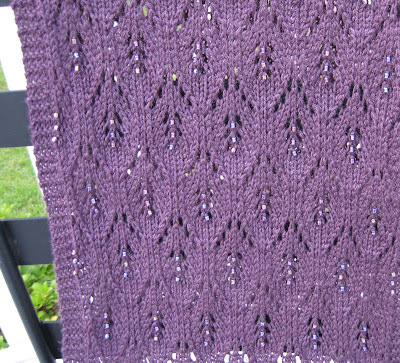 Knitting lace with beads - same pattern, same yarn (pretty much), but . . . less really is more - don't you think? It's going to be a scarf. I think the overall effect will be even better once it's off the needles and blocked. I finally finished big blue. I love everything about this one. I love the yarn, the color, the pattern (this is the 4th time I've done it - here's my original post that gives all the details should you want to take this one for a spin). I love it so much, I got grass all over taking this picture of it. I would have been done about 4 days ago, but I messed up on the sleeves, didn't make them wide enough, so ripped them back more than halfway and reknit them. My wonderful and brilliant spouse once mentioned that I should be more in depth, technical I guess, when I post. Since he's right about pretty much everything else, I thought I'd include some close ups of my sleeve attaching method. I grew up sewing my knitting together and maybe I'm just bad at it, but I always ended up with weak, gap-y seems that looked like, well, crud. Whatever you were wearing underneath would peak though at the shoulders and neck, ugh, a nightmare. Ever heard of That Dorky Homemade Look? So, whenever I can manage it, I pick up sleeves and knit down using an alternating 3/4 times two and 4/5 ratio (pick up 3 stitches of the first 4 rows two times, then 4 stitches of the next 5 rows, repeat this set of three and no matter the gauge, I find I always get a perfectly flat join). I never cast off for necks, either, I put all my decreased stitches on holders or scrap and knit my necks up. But, competing with my love of pick up and knit sleeves is my love of working anything that has to match at the same time. I must be a lazy slob because I have a real hard time getting sleeves to match when I knit them one at a time. So . . . for this one, I combined my favorite techniques. I knit my two sleeves at once (twice, but never mind that right now) having double checked the math of stitches to rows, then once the sleeves were complete, I knitted up the stitches along my armholes and knit the two together. Best of all possible worlds. The middle picture is the outside of my sleeve join, this last one is the inside. Now I just need some weather that's not hitting the 90 degree mark . . . .
Kind of a pretty mess, isn't it? Maybe a little bright. The small one and I have been having fun with food color. I've arranged 4 of my favorites from our latest batch of dying below - one new twist, black food color. I had an inspiration a couple years ago, it was actually a quilt I saw in the catalog for Keepsake Quilting - I don't get the catalog anymore and I think I threw out all the old ones and I didn't keep any of my old copies, so I don't have a picture to share. Dumb -- it was lovely. But the quilt was a mullioned frame, black fabric around bali windows. I thought it would be cool to make a sweater like that using KOIGU. But that would cost $200.00. So maybe I can try with this stuff. I also like the blue/purple/black colorway for an Amy Rose redo. And this is my stab at beaded knitting, take two. A scarf, I think. I'm thinking the green and teal should go on some gray lace weight I've stalled out on . . .